After watching the Korean drama “you who came from the stars“, the Korean Brand “IOPE” suddenly boomed into popularity. 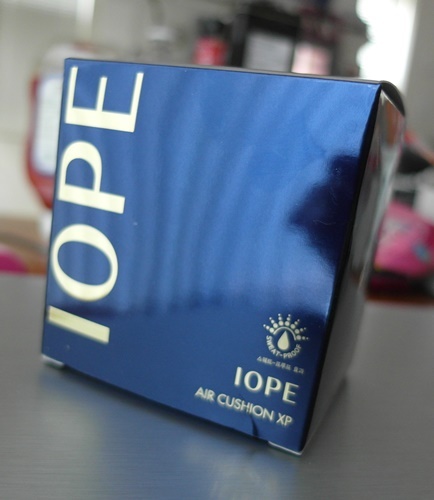 For a time, IOPE had been completely cold out because of high domestic and oversea demands. 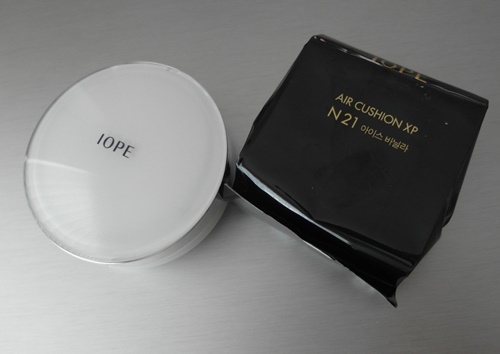 The Air Cushion is one of the most popular items in the IOPE line. 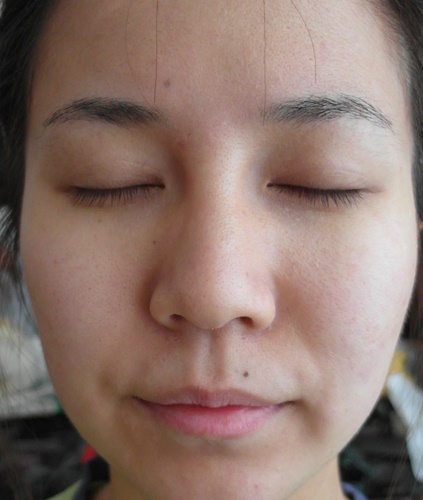 The finish is to be “dewy”, “natural” and “lit-from-within”. Who doesn’t want porcelain doll-like complexion like hers? I do!! It is authentically from Korea. Everything on it is Korean, hahaha. The packaing is simple and chic. 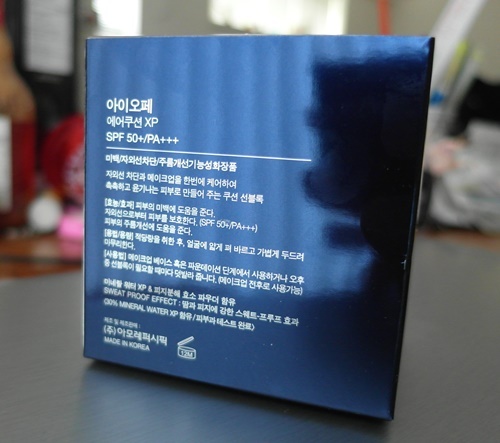 I especially like the dark blue-y colour of the box, its reflective surface can almost be a mirror. Inside, there is it! The hot topic of the day (Yay). 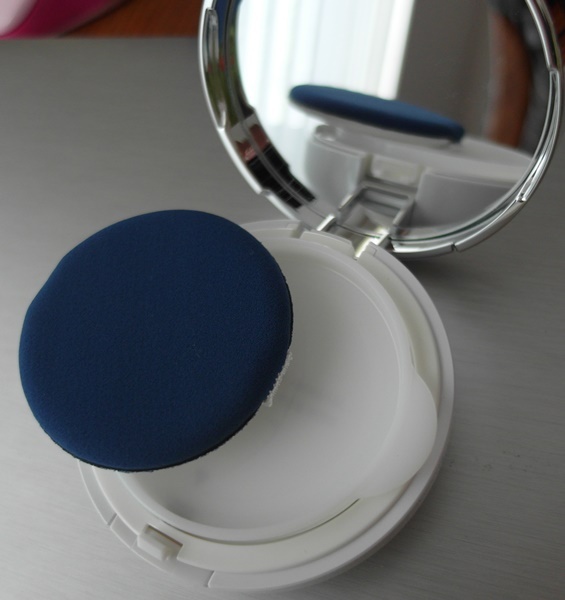 Pearly white compact Air Cushion itself! 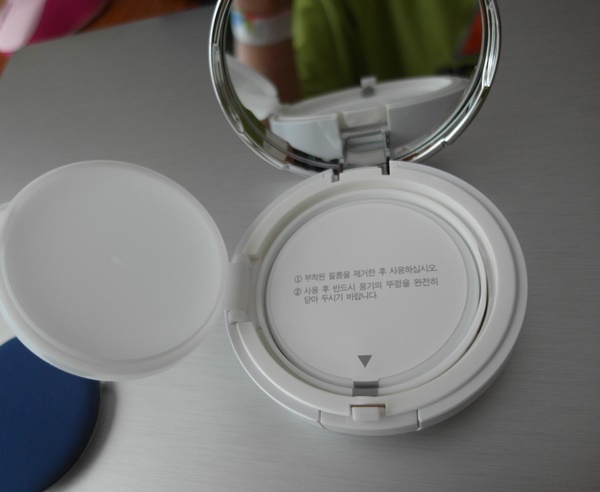 It also contained a refill of the air cushion foundation (what a deal). So far from all my orders of Korean cosmetics, they always come with a refill counterpart so you never run out. The cushion is very much like the Sulwhasoo puff which I shared previously. Except the colour is of a royal blue. The plastic shields the product from unnecessary contact with air so it doesn’t dry out. I don’t peel away the plastic shield completely. 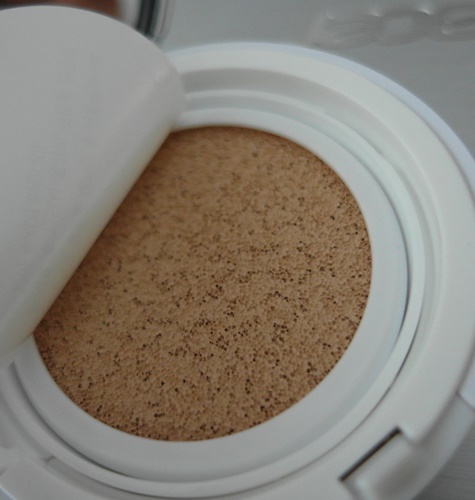 I usually lift a corner the size that’s enough for me to get some foundation so that I can recover the top back on, just to keep it fresh. I chose N21. From the online picture- it should be my colour but it’s still slightly too light for me. Orz. Have to make do at the moment, ahaha. I am sure you are use to seeing my naked face now. It’s crawled by many imperfections. 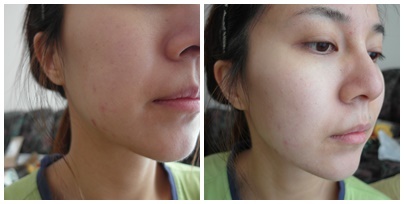 I have the cursed dark circles, uneven skin tone, dull texture and blemishes from sensitivity and rosacea. My skin is brighter and skin is more refined. 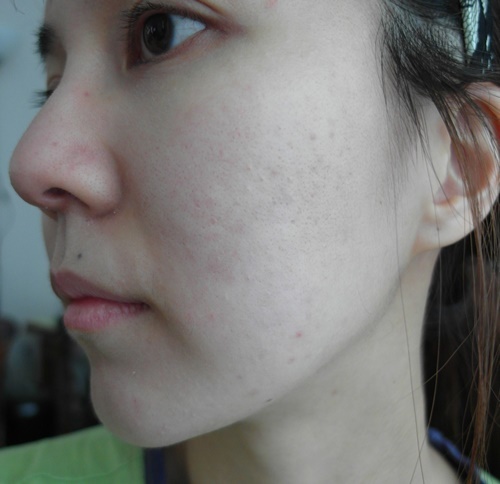 But if you take a close look (I am so brave LOL) let us zoom in- you can still see the redness and the uneven texture of my skin. I have combination-dry skin, so my face does turn greasy after 3-4 hours and touch-up is mandatory (or suffer from makeup landslide). Ps. Besides IOPE I have not used any other makeup or concealer so that I can showcase the true result of the makeup. 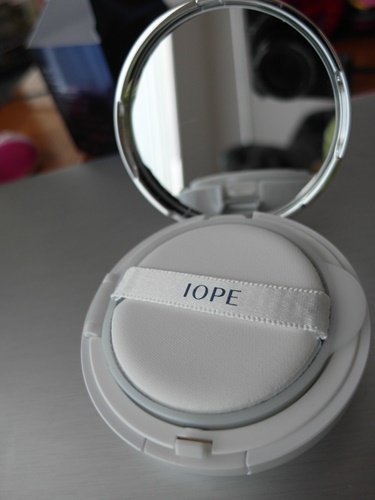 For combination or oily skin beauties- if you are hooked with the radiant and natural finish- do apply matte primer or oil-free primer before you use the IOPE so that your makeup can last longer. For dry or dehydrated skin beauties- do give this a try. It may be the one-touch miracle foundation you are looking for!